We operate out of a single fire station, providing fire and emergency medical (paramedic) services for all of the Village 24 hours a day, seven days a week. We also provide and receive mutual aid services for several of our surrounding communities. 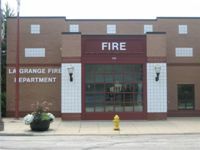 The mission of the La Grange Fire Department is the preservation of life and property of citizens and visitors of the Village of La Grange from fire and medical emergencies by maintaining the readiness of personnel, the fire station, and equipment to promptly respond to a citizen’s request for emergency, rescue, or both accidental and natural disasters. This shall be accomplished through fire suppression, advanced life support emergency medical services, fire prevention, code enforcement, training, and public education. How can we schedule someone from the Fire Department to come out and make a fire safety presentation to our organization? If I call for an ambulance, will I receive a bill in the mail for these services? How can we schedule a group tour of the fire station?